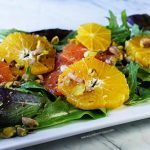 Honey Glazed Orange Salad is light, bright and delicious, simple and amazing. This is a perfect side salad and a celebration of winter flavors - enjoy! Peel the orange. Slice off the top and bottom of the orange, that way you'll have a flat surface. Then you'll slice off the the rind and pith. Work your way around the orange slowly. Use your sharpest knife. If you miss some of the pith, just go back and shear it off. When you've done removing the rind slice each orange thinly. Crack the pistachios and lightly chop them. Combine all of the ingredients for the salad dressing and whisk together, mixing well. Drizzle over the salad lightly. You can always add more, tough to take too much away! Serve immediately and enjoy!